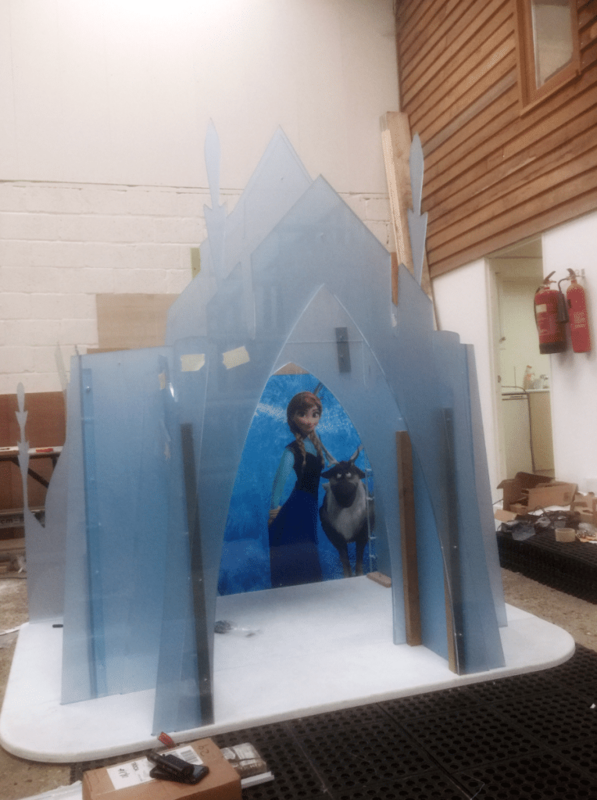 Bespoke wardrobe, in the style of a Frozen Castle. 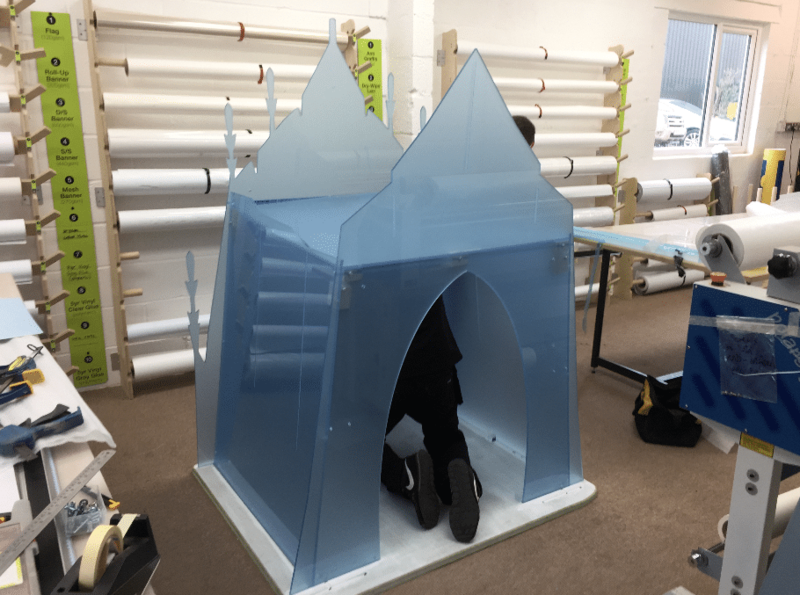 Having previously used sign making techniques for some unusual projects, when a customer asked us to help create a wardrobe to look like a Frozen castle we knew we had the necessary skills to help create a unique piece. With such a unique project the first step was to digitally design the unit. While most of our projects involve 2D design, this called for 3D work to make sure everything fitted correctly and to achieve a more realistic preview of what the finished product would look like. Using SketchUp Pro we could create a 3D digital model that allowed for easy alterations before any materials were even cut. 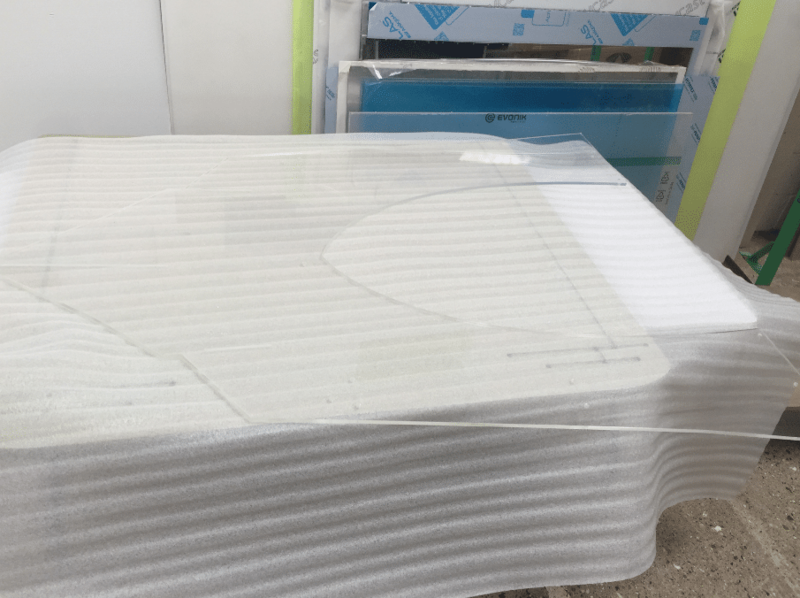 With our in-house CNC router we easily cut all the needed acrylic panels to exact size and shape. 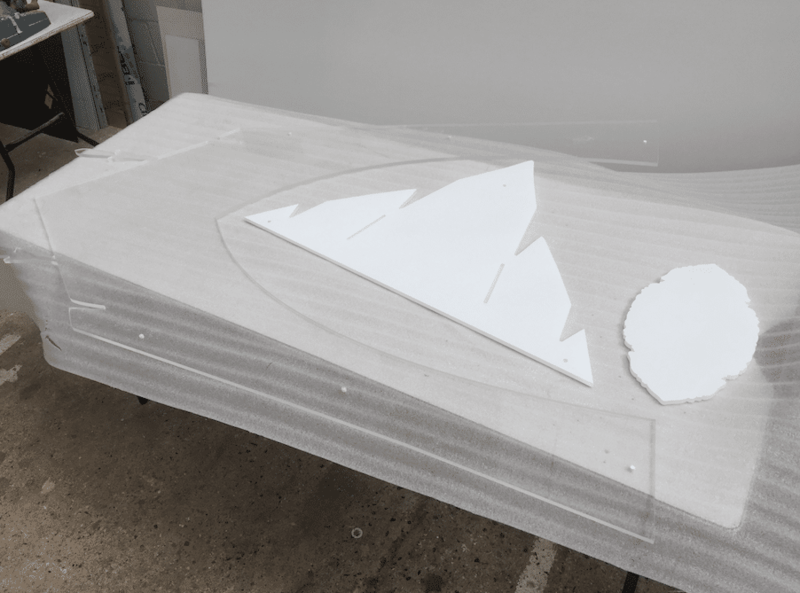 Thanks to the computer control, we are able to cut shaped panels far more accurately than cutting by hand, making the intricate shaping of the castle far easier to achieve. Because the brief included an illuminated edge it was necessary to polish the cut edge of the acrylic. This is done with an oxyhydrogen torch which produces a small, controlled, high intensity flame. Using the torch to carefully melt the surface of the edges creates a smooth and crystal clear finish. To create a magical, glowing finish we used an RGB LED system. Unlike standard LEDs, RGB LEDs can change colour and can be programmed to perform colour change and flash sequences. The system we used included a remote control to allow the customer to easily change the program themselves to suit their needs. 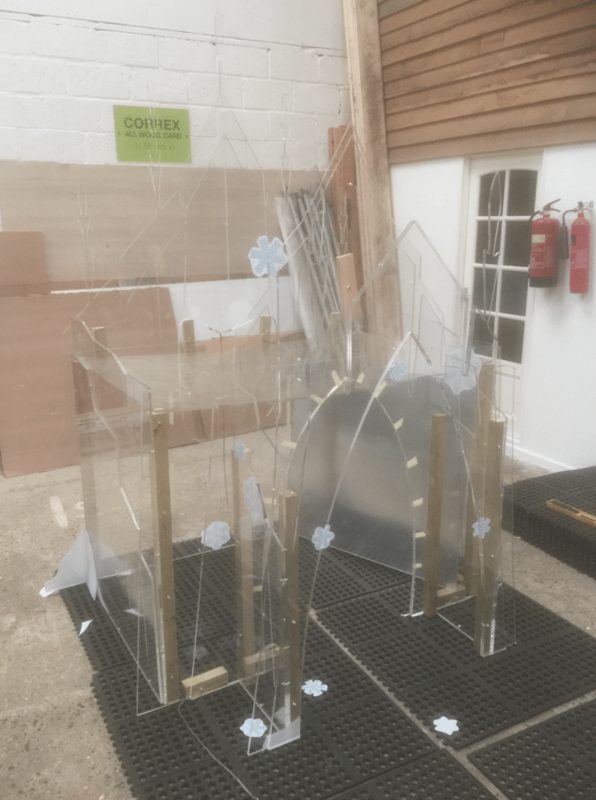 The original brief was for the acrylic panels to be produced in clear acrylic, to look like ice, unfortunately on seeing the clear acrylic panels the customer decided that they didn’t look enough like ice. Thanks to our knowledge of sign making materials we had an instant solution, add a tinted frost. 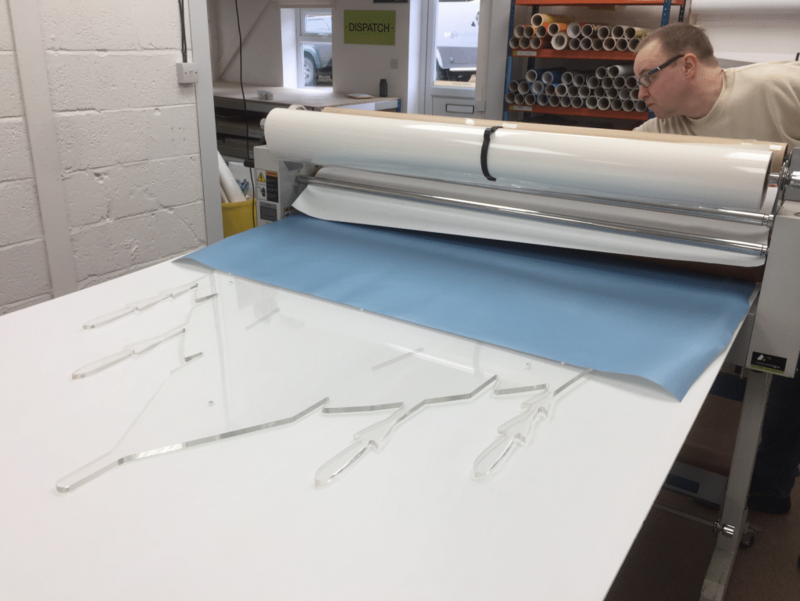 Typically frosts are used to tint windows, but they can also be used to add an effect to acrylic signs. We decided that a blue tinted frost would add to the ice effect. 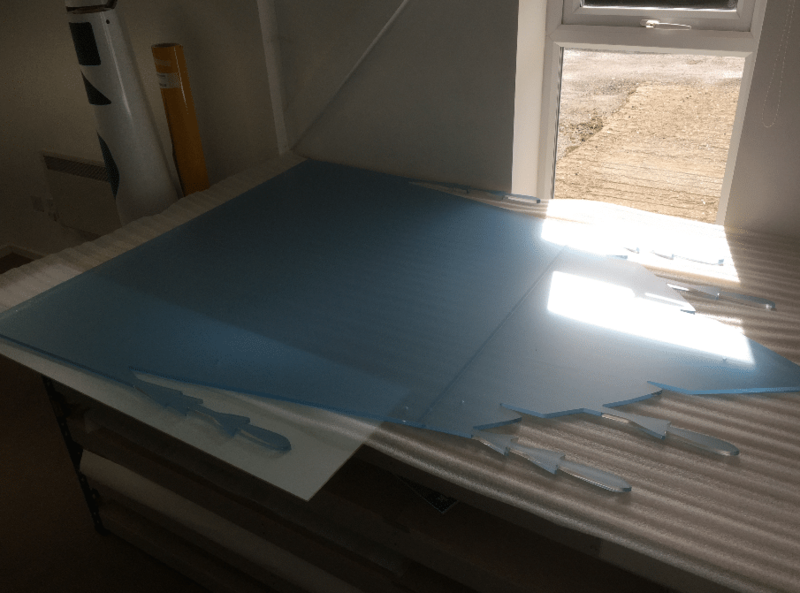 Using a frost saved a lot of expense in cutting new panels from a coloured acrylic. Finally we added a printed graphic to the inside of the wardrobe. Our wide format printer meant that creating a graphic this size wasn’t a problem. Once all the panels were created, we assembled the wardrobe in our workshop to confirm all the pieces were the right size. Everything fitted as expected, so we were able to disassemble the wardrobe and provide it as a flat pack unit, ready for the customer to install.